This is an auspicious year for lovers of gegika, and probably just lovers of comics in general: in 2013, Drawn & Quarterly has published not one, but two translated collections of the peerless Shigeru Mizuki's work. First we had the first volume of his Kitaro comics, which I wrote about excitedly here. 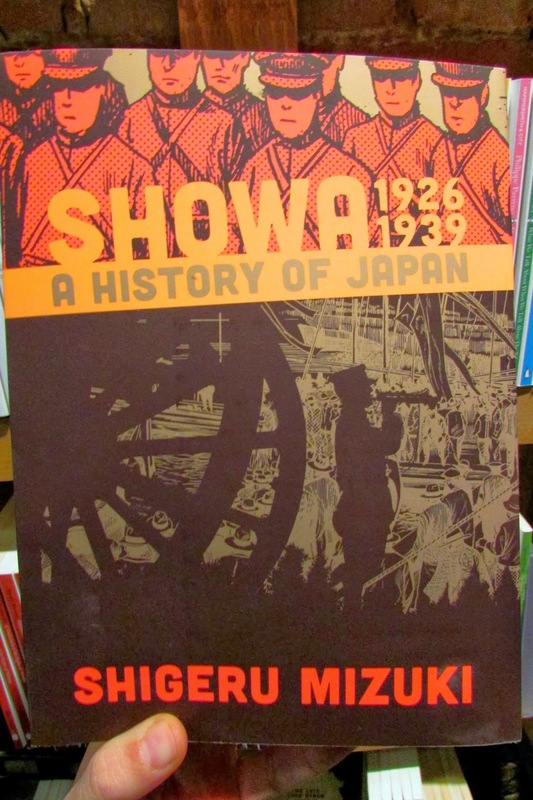 And now we've got the first volume of his History of Japan series, spanning the years 1926-1939 of the Showa (or "peace"/"harmony") period! First of all, this cover is utterly gorgeous. And even better in real life than in a photo, I'm telling you! Wise and loving Nonnonba, Mizuki's grandmother figure who was immortalized in Nonnonba, is present here as well. Nezumi Otoko (Rat Man), a regular from Kitaro, guest stars as well, providing historical narration and offering a bridge between Mezuki's childhood world of boy gangs and spirits, and the heavy events taking place on the war front of his homeland. Anyway, Showa is a real gem. If you've never read Mizuki before, this could be a good place to start. And if you are already familiar with his work, surely you will want to get your hands on it immediately!